﻿Published by Sareth Ney on April 10, 2017 at 7:50 a.m.
JACKSONVILLE, Fla. – Everclear will bring their Fla. tour to a close at Maverick’s at the Landing, on May 2. The Dog Apollo and Skyview will also be on the bill. Their statewide tour will begin on April 27 at Parker Playhouse at Broward Center in Ft. Lauderdale, Fla.
Art Alexakis is the vocalist and guitarist, Davey French is the guitarist, Freddy Herrera is the bassist and Jake Margolis is the drummer of Everclear. Herrera and French assist with backup vocals. They are an alternative rock band from Portland, Ore. Some of Everclear’s records include: “So Much for the Afterglow”, “Songs From An America Movie Vol. One: Learning How to Smile”, “Songs From An American Movie Vol. Two: Good Time For a Bad Attitude”. “Black is the New Black” was their latest. Evan Smith is the guitarist and vocalist, Chris Perrella is the bassist, Justin Griffin is the guitarist and backup vocalist, Nick Atkins plays the synth and provides sequencing and Jonathan Harrington is the drummer of Skyview. They are an indie, electronic and rock band from Jacksonville, Fla. by way of Tallahassee, Fla.
“The Sound of Light” was Skyview’s first album. It was released on May 15, 2013 and featured 13 tracks including: “The Sound of Light”, “Window”, “Light to Follow”, “Tonight” and more. Chris Rudasill is the lead guitarist and vocalist, Daniel Mauger is the rhythm guitarist and Vitaliy Morgun is the bassist of The Dog Apollo. They are a rock and roll band from Jacksonville, Fla. According to their Facebook profile, they are unsigned and about the music. Their influences are walking, working, sleeping and living. Since forming on Dec. 25, 2015—they have six songs listed on their ReverbNation page consisting of: “Lakeside”, “Tomorrowland”, “I, Miner”, “Evening”, “Spirit of the Plain” and “Mediterranean Song”. 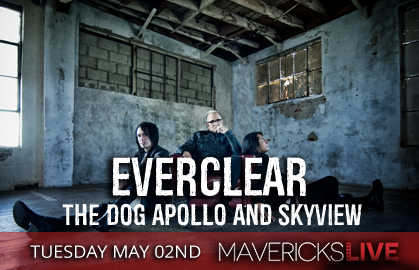 Tickets to attend the Everclear, The Dog Apollo and Skyview concert start at $25. The meet and greet package is available and it is $150.00. Ticket prices exclude convenience handling fees. The meet and greet package comes with the following: general admission voucher, very important person (VIP) early entry into the venue, exclusive preshow meet and greet with Everclear, personal photograph with Everclear, autograph session with Everclear, private, intimate acoustic performance by Everclear, specially designed Everclear tour shirt, collective tour autographed poster which are numbered and limited by Eveclear, exclusive VIP item and official meet & greet laminate. Doors open at 7 p.m.
April 27 - Parker Playhouse at Broward Center, Ft. Lauderdale, Fla.
April 28 - King Center for the Performing Arts, Melbourne, Fla.
April 29 - The Inlet, Fort Pierce, Fla.
April 30 - Capitol Theatre, Clearwater, Fla.
May 1 - Club L.A., Destin, Fla.
May 2 - Mavericks at the Landing, Jacksonville, Fla.
May 11 - Crystal Ballroom, Portland, Ore.
May 13 - Northern Quest Casino, Airways Heights, Wash.
May 14 - Pub Station Ballroom, Billings, Mont. May 19 - Deadwood Mountain Grand Event Center, Deadwood, S.D. May 21 - Two Rivers Convention Center, Grand Junction, Colo.
May 26 - Treasure Island Resort &Casino, Welch, Minn.
May 27 - Bratfet, Madison, Wis.
May 28 - CrossroadsKC, Kansas City, Mo. June 2 - Home Bar, Arlington Heights, Ill.
June 3 - Four Winds Field, South Bend, Ind. June 9 - Hampton Beach Casino Ballroom, Hampton Beach, N.H.
June 10 - Celebrate Fairfax Festival, Fairfax, Va.
June 16 - Downtown Duluth (Canal Park), Duluth, Minn.
June 17 - Bluestea Center for the Arts, Moorhead, Minn.
June 18 - The Cotillion, Wichita, Kan.
June 22 - Cherokee Casino West Siloam Springs, West Siloam Springs, Okla.
June 27 - The Marquee, Tempe, Ariz.
June 29 - House of Blues, Anaheim, Calif.
July 14 - Jackson County Fair, Central Point, Ore.
Aug. 4 - Chamblee City Park, Chamblee, Ga.
July 5 - Carrollton Summer Concert Series, Carrollton, Ga.